Only 2h 32m 53s left! 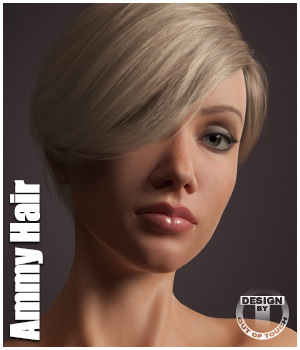 Renderosity is holding a Live Webinar by Nerd3D, who will show the ins and outs of La Femme 1 for Poser 11. Nerd3D, who as a member of the design team did rigging and advanced testing of La Femme, will cover a variety of topics and answer pre-submitted questions from the community. 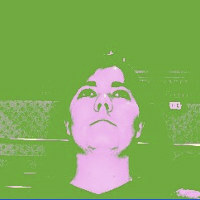 The webinar is slated for 5 p.m., CST Wednesday, Feb. 13. The cost of this event is free but is limited to the first 100 registrants. 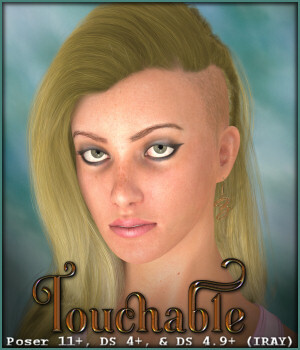 A recording of the webinar will be uploaded to Renderosity's Tutorial section afterward. Read more about or register for the webinar. La Femme 1 for Poser will become your go-to figure in Poser 11. Available exclusively at Renderosity, the new figure takes advantage of the development team's collective century of design experience to make use of all the features and power found in Poser 11. Team member Denise Tyler said she thinks the digital arts community will be pleasantly surprised with La Femme for Poser. "I had hopes with each new figure that came out for Poser and as much as I appreciated all the work that people put into it, yet that 'it' factor was missing in them," she said, adding La Femme was designed with the "it factor" in mind from the start. With the full support of Renderosity and Smith Micro, a team of veteran Renderosity vendors with more than 100 years of combined experience with Poser worked to build the new figure from the ground up. • Special thanks to Stefan Werner for contributing the SSS with Refracted Eyes shader and the Renderosity testing team. Tyler said the group worked together, chatting about ideas and squashing bugs over the past few months before passing it on to Renderosity for its thorough testing process. "The end result? The first Poser figure in years that I’ve had fun working on, and working with," Tyler said. 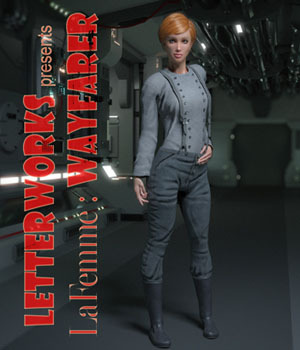 "The Figure Team of 4, the fantastic 4 as I like to call them, worked tirelessly to get this figure to the Poser Community," said Jenn Blake, Renderosity marketplace manager. "They saw how much it was needed, and worked from their heart to produce something they felt the Poser Community could fall in love with." "Long days, 16 - 20 hours, were not unusual, but everyone just kept on working until she finally came to be," Blake continued. "The only goal in mind was the hope that the community would adopt her. I have thoroughly enjoyed the process over the past year and am grateful to have been able to be a small part of it. Thank you again to everyone who worked so hard to make this happen!" She grew on me, especially with posing her and not having any problems. But, man, do I love her feet! If you think about it, base characters are not supposed to be beautiful, but what makes them fantastic is the morphs to build nice characters. If she can be as versatile as V4, she will be a hit. She has so much more in her than other characters, and we are used to so little. I still can´t get over her feet! The toes move! Dance poses are now perfect. I will have to make poses with attention to her feet. And you bet I will. I switched to DS for a while and it was like a breath of fresh air to have decent figures and content to work with, even though it took me months to learn DS and how to make content in it. I had hopes with each new figure that came out for Poser and as much as I appreciated all the work that people went into it, I’ve always preferred the long lean supermodel look, pretty right out of the box, the “fantasy” type shape. That was the “it” factor that was missing for me. Most of the Poser figures that were coming out had shapes that were more “real world” oriented, and I, like many in the Poser community, like fantasy and fashionista art. Now La Femme is "it." "A breath of fresh air for all my new renders! She is very easy to use, natural looking, amazing when creating detailed morphs and versatile and gorgeous even right out of the box. Very well proportioned, realistic and truly a fantastic addition to the Runtime, she will fill the heart of the Poser Community with joy and fun." The La Femme figure for Poser 11 uses a beautifully sculpted base model that gives artists what they need to create beautiful images. The advanced rigging is designed to make her easy to pose and keeps the complexities of the figure out of your way. La Femme comes with a wide variety of morphs as well as the ability to be further sculpted with scaling and body control handles. 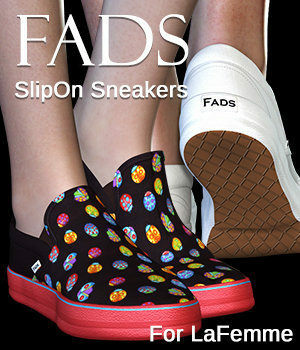 She includes highly detailed texture maps and hybrid materials that work in both FireFly and SuperFly. This gives you capability and usability no other figure offer. La Femme is absolutely beautiful to work with. What I liked most was her joints. They are smooth and natural in every pose, unlike older models that have breaks and creases that shouldn’t be there. She also renders with ease. While I was working with her I couldn't help thinking to myself FINALLY Poser has the perfect figure. I only use Poser. I have been waiting for years for a figure like LeFemme. If you are like me and only use Poser, you are going to fall in love with her! 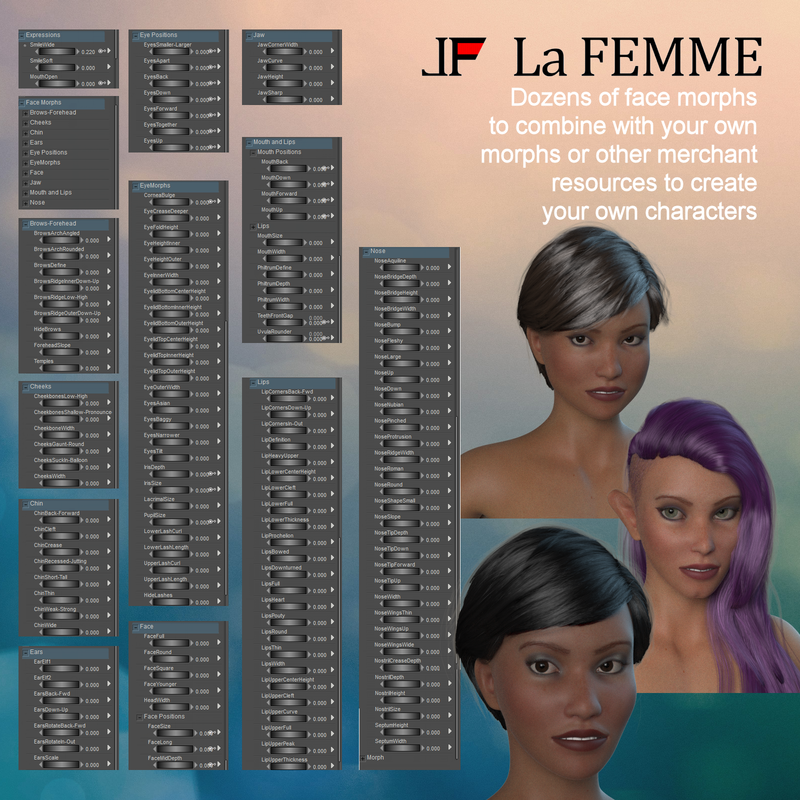 The creators of LeFemme have packed her with so many realistic morphs. I am excited about this character and will be making lots of content for your runtime! 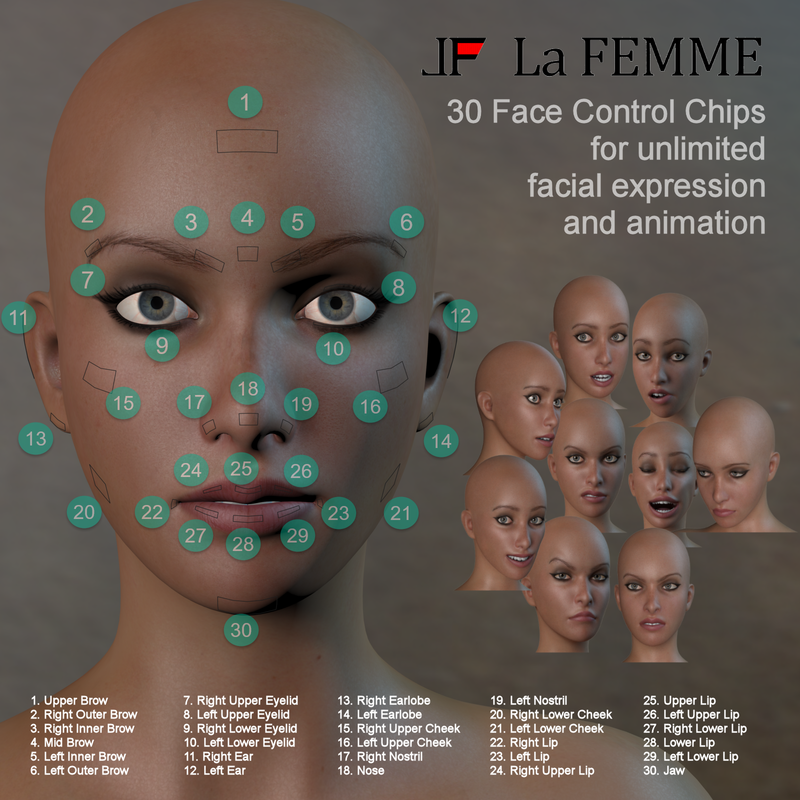 La Femme 1 for Poser 11+ contains improvements on previous Poser figures and includes a variety of new textures, advanced facial expressions, Talk Designer compatibility and more. 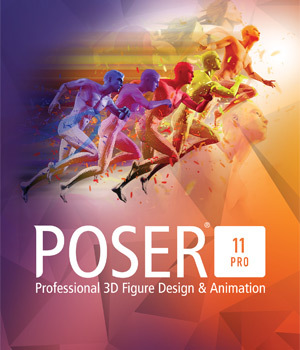 "La Femme is the figure Poser 11 has been waiting for," said Charles Taylor, a.k.a., Nerd3D, who was responsible for her rigging and tutorials. La Femme 1 for Poser 11 uses a beautifully sculpted base model that gives artists what they need to create beautiful images. The advanced rigging is designed to make her easy to pose and keeps the complexities of the figure out of your way. La Femme comes with a wide variety of morphs as well as the ability to be further sculpted with scaling and body control handles. 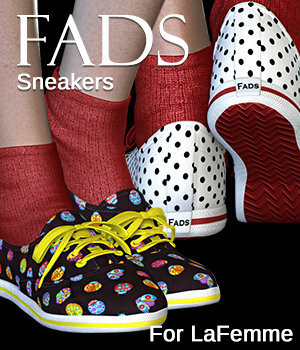 She includes highly detailed texture maps and hybrid materials that work in both FireFly and SuperFly. "This gives you a capability and usability no other figure can offer," Taylor said. 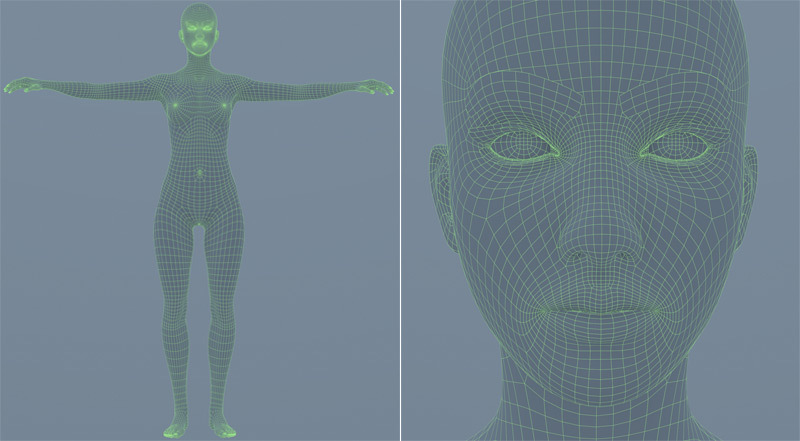 La Femme uses advanced rigging to take advantage of the features in Poser 11. • Extremely easy to pose and animate. • Body handles give amazing flexibility in the figure. 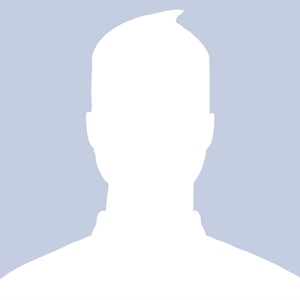 • Fully rigged face is remarkably expressive and easy to use. • Weight mapped figure scales can add even more variety to characters. If you don't believe it, check out her native expressions. Her advanced rigging gives her realistic hand and foot posing. In fact, she is the first Poser figure who can cross her toes. La Femme's materials are designed for subdivision, faster response when posing and high detail when rendered. Her hybrid materials support FireFly for speed and SuperFly for realism and include a variety of material presets designed to fit your specific needs. • Torso Gens and No Gens color, bump, and spec maps (4096xx4096 resolution). Poser 11 or higher required. 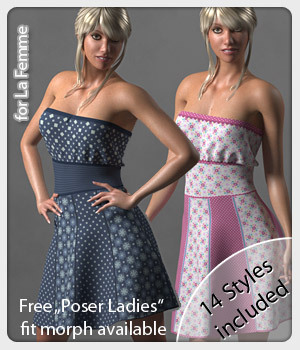 La Femme uses features that are only available with Poser 11 and later. Content created with earlier versions of Poser will not be fully compatible with La Femme. 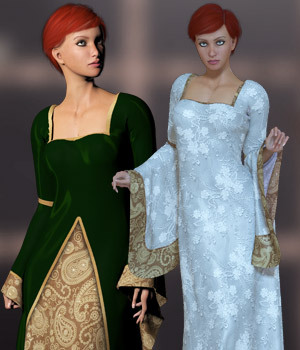 La Femme Starter Bundle - Clothing, Characters, Hair and Poses! 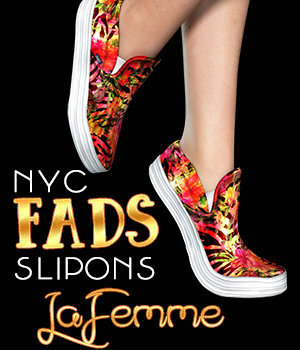 La Femme - Ultimate Clothing and Shoes Bundle! La Femme - Essentials of course, Poses and Hair! It seems that I cannot download it (?). It says: '' Shopping Cart Items do not meet the Minimum Purchase Price of $3.50 ''. She looks great, I am eager to download her! Very nice. Will we see a L'Homme as well? Congratulations to the production team! I hoped Blackhearted would have been roped in to make a new figure from Poser 11's inception. Better late than never. I like what I see, but are more ear morphs forthcoming? The HD ear morphs do not quite define the back of the ear as much as I had hoped or offer any change of the elements. I hope you guys get some rest, and the reward for your efforts. Very smart to make her free. After playing with the base figure for only an hour, I feel like I purchased an entire bundle of morph and magnet sets. I see so much potential with this figure. I can't wait till developers go manic with producing content for her. Good job on this figure for Poser. I can't wait to try her. The figure is a cost of $0.00 and free, the system has always required a $3.50 minimum purchase to checkout. I have added the statement to the product page: "Minimum purchase requirement of $3.50 is required." I hope this helps clear up any confusion. There are also some great Poser Bundles right now with her in those as free also. Or one of the Content Bundles for her as well listed there. Or if you can't find anything you want today you could purchase a $5 gift certificate for a later purchase once you have decided you like her and want to buy her some shoes. We are adding a mess image right now. Check back in a few minutes! Anyone know how long the promotional offer is good for? Question. Could v4 clothes fit her? I would like a l’homme too. Like Sean Martin I look forward to L'Homme to complement La Femme! The figure looks great! Are there any utilities allowing to convert existing V4 clothes and/or hair to La Femme? Can't wait to try her out, she looks terrific! Excellent product! Does this include a development kit or is it available separately? OMG, can't wait to try her out! Thank you all for your hard work. So excited for this! Blackhearted's HD version is gorgeous and I may pick her up just for a few renders and to see how she ports out to DS. Before I do anything I want to know. Is she compatible with Poser Pro 2014? She looks gorgeous. But I wonder, is she compatible with PoserPro 2014? Dev rigs are included in the figure files. As well as templates. I have her installed and rendering in PP 11, and just popped the two Morph Packs by BH and Deecey in the cart. Just waiting for the $ to appear and they're mine! She looks great, and her feet ARE amazing. Easy to load, get hair parented, just want those morphs now! V4 clothing does not fit La Femme. 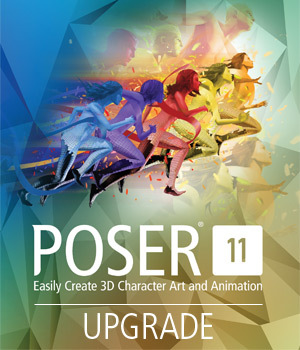 To get any updates to your current Poser 11 simply open Poser 11..go to Edit/General Preferences/Misc tab. there you can be sure check for updates is checked. And you can click Check Now also. What about Daz Studio users, will La Femme ever be available for Daz Studio Pro?? However, in poser excellent addition to the models. Have been working with her for a day now and she's great. Love all the available morphs. Like many Poser users, I have heard promise after promise about the next Poser figure being THE ONE! Usually, not long before the lack of support and promises fade into static. 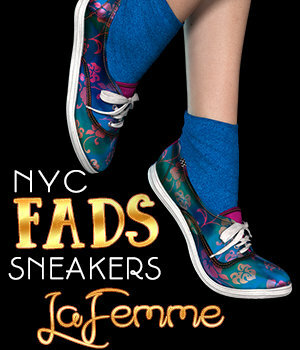 I was surprised when Rendo announced La Femme and to be honest, more than a little sceptical about the claims for her. However, I did download her and, after a few days playing around, I'm going to have to hold my hand up and say, I am very, very impressed. In fact, I'd go as far as to say that Victoria has finally met her match! At last! I shouldn't really be surprised given the illustrious team behind her creation and I look forward to seeing her progress from potential to must-have. Hopefully, many more vendors will be tempted to jump on board and start creating for her because, after all, at the end of the day without their (and the buyers) support she will remain just another figure. La Femme is much more than that so let's get behind her, Poser and Renderosity (who, after all, are the ones with the courage to stand up, put their money where their mouths are and bring her into being in the first place!) OK People! We've got the figure we sorely needed. Now lets back her to the hilt! I am impressed with La Femme! To date I've been solely using V4-Weight Mapped-and now V4 Evolved. LaFemme is a nice progression. Fantastic posing. I also like the HD morphs-and textures. The re-engineered eye is great too. 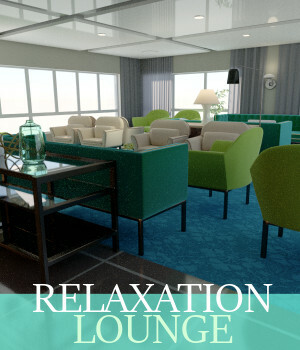 I prefer to get close to the Uncanny Valley in my renders-and this one is a step closer. Maybe,this is best figure in poser since Poser was born.Now its time for her partner(LaMale).I have almost all purchased items and ad-ons for this BABE and want more.My wish is more conforming clothing,shoes,poses,ech...from our very tallented artists on this site. Looks like the best attempt so far to create an updated Poser option for people. I even say some things I wish were G8 compatible. While I have no intentions to change myself from Daz but wish you all luck in this endeavor.